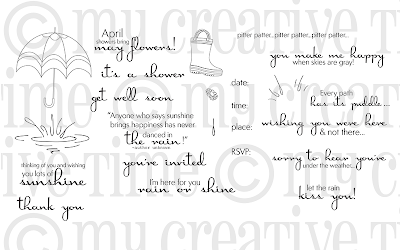 My Creative Time: Pretty Paper, Pretty Ribbons Birthday Blog Hop!! 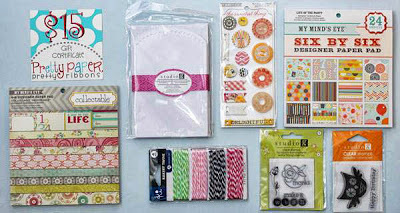 Welcome to the Pretty Paper, Pretty Ribbons Birthday Blog Hop!! Today we are celebrating Lisa's (owner/designer of PPPR) birthday! She had a plan for this hop, but we (the Design Team plus guests) have a plan of our OWN because we LOVE her!!!! We are all making special birthday projects using some files from the Pretty Paper, Pretty Ribbons store AND since birthdays are all about celebrating with friends and giving gifts, we decided to add guests to the lineup and giveaway a TON of prizes!! 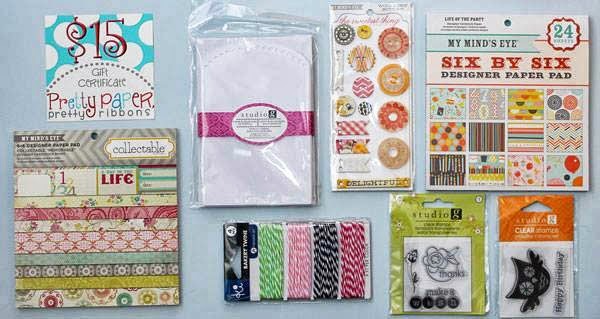 These awesome prizes include fun twine, stamp sets and gift certificates to some of our favorite crafty stores!! You seriously do NOT want to miss a single stop in this hop! If you are coming to here from Jeanne's blog you are in the right place! If you have just stumbled upon this hop, make sure to head back to the Pretty Paper, Pretty Ribbons blog! But remember - and this is important! - Lisa does NOT have the correct lineup on her blog, because she doesn't know there has been a few ADDITIONS to the lineup thanks to her DT!! SURPRISE, Lisa!! Lisa will direct you to the correct blog, but after that please disregard her lineup!! Now onto my project!! But FIRST I would like to say "HAPPY HAPPY BIRTHDAY to YOU Miss Lisa!" ~ Peachy Keen's "In the Garden Face Asst"
For a chance to win, you must be a follower of each blog and also leave a comment on each blog. For extra chances, you can also 'LIKE' Pretty Paper, Pretty Ribbons on Facebook and/or sign up for the Pretty Paper, Pretty Ribbons Newsletter. A random winner will be chosen for the prize on Tuesday, September 24th. Only US or Canadian mailing addresses please. Okay, now for my giveaway! 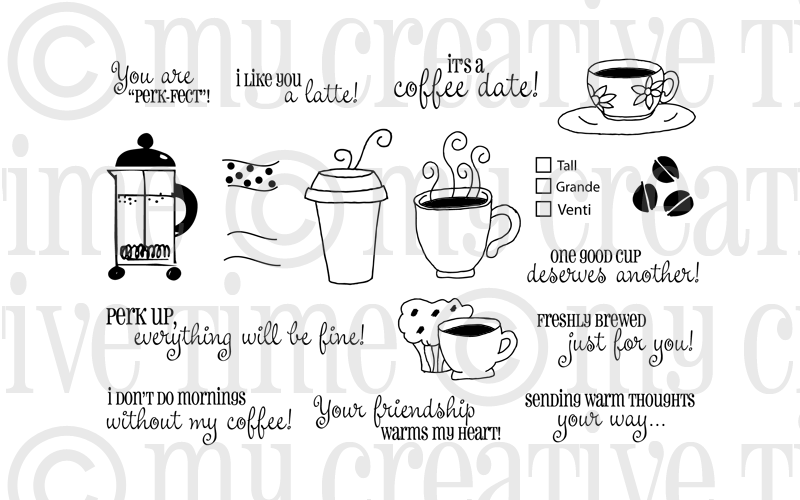 Yep, I am giving away 2 stamp sets from the My Creative Time store! These 2 stamp sets will go perfectly w/the 2 files that Miss Jeanne is giving away on her blog HERE! 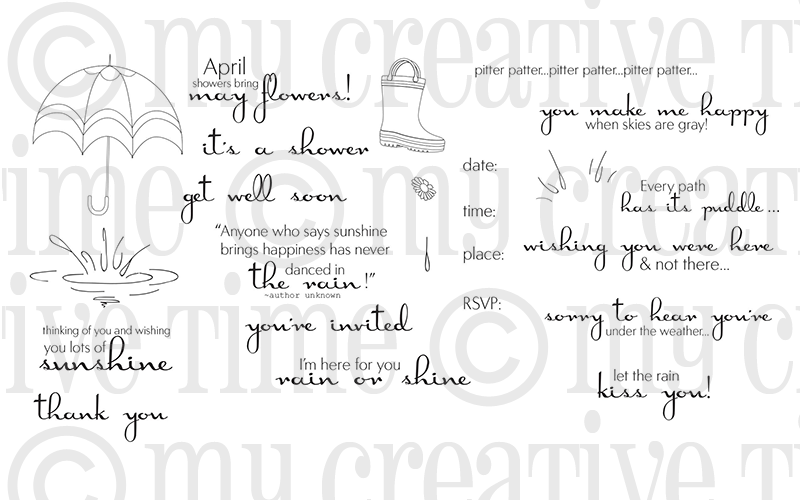 "I'm Here for You Rain or Shine"
With our blog hop also comes a new Pretty Paper, Pretty Ribbons Challenge!! The theme of the challenge is Birthday and you can link up your projects at the Pretty Paper, Pretty Ribbons blog until Sunday, October 12th for a chance to win a $10 gift certificate to the store. We can't wait to see what you create using PPPR files!! Now onto the next stop in the hop!! Head on over to Miss Melisa's blog!! Here is the CORRECT hop lineup in case you get lost along the way!! Your card so cute! I love the candy corn idea for a fall birthday. Great job! So darn cute...love that candy corn guy...too cute!!! Your candy corn card is soooo cute. It really does look like he is stepping out of the card. Good job! and thanks for sharing!!! Darling card!! What a treat for sure!!! Thanks for sharing!! What a cute card! so clever the little candy corn is stepping out of the frame. super cute! I love candy corn and your card is adorable! TFS! How cute is this candy corn!!! Adorable Emma and ever so sweet of you guys to do this!!! First - what a fabulous friend you are for adding your line-up to Lisa's! You've definitely added more "Happy" to her birthday! Your thoughtfulness, as always, is amazing and inspiring! Second...eeeee, how CUTE is your balloon-bouquet toting Candy Corn! Super darling, super sweet, super awesome! Creativity, plus, Emma!! This is adorable! Candy corn is one of my favorite candies too. Love the glitter and the balloons. Eek! So glad its candy corn season...love the sweet little project. Looking forward to hopping along...Thanks Emma! aww Emma I love your card and I too am a candy corn addict :-) Thanks for joining the PPPR design team in surprising Lisa for her birthday! Yes, that candy corn guy is definitely stepping out with those birthday balloons. You pulled it off brilliantly! OMG Emma!! This is the cutest card EVER!!! I LOVE that candy corn guy with his PK face...too cute!!! Oh this is so cute Emma! The sentiment is perfect too! Emma you made the cutest little candy corn person...do you say person ha ha it is just so darn cute. I love your balloons using your new dies and everything about this card is perfect...even the bows on the balloons! Oh this is the cutest candy corn little gal. Miss Emma, thank you for the opportunity to get more MCT awesomeness! Love your card! You have done another wonderful job! Thanks for the chance to win! Your card is adorable! That will put a smile on any birthday girls face. As usual Emma...an amazing job on your card. I love the little glitter top on the candy corn...Thank you for the chance to win your blog candy! Love it all! Wow ,I love your idea , it is super cute!! 'I love candy corn as well, and this one looks delicious !!! I agree!! A Cutie Patootie of a card!! AWESOME job! Thanks for chance to win!!! Love the candy corn with the PKS face! Emma. Such a cute card. Thanks for the chance to win. Love your card!! The little guy is so cute stepping out of the frame with the balloons!! Just adorable!! I love your card Emma. I think it is cute how he looks like he is stepping out to give her the balloons. Thanks so much for joining us in this blog hop to surprise Lisa. love candy corn also! every year My nails are candy corns. What a cutie of a card your candy corn is to sweet for words. I love your matching envelope. Miss Emma you creations always blow me away as you are just so stinkin' creative and I love the face stamp you chose too. ps. Glad you are feeling better....this alone makes me feel happy, happy, happy. Thanks for a chance for your awesome goodies. Oh my goodness- what a darling card! I LOVE the Candy Corn Guy file, what a cutie! And, he looks even cuter with those fab balloons! Thanks so much for helping us surprise Lisa on her special day - it's been a great hop! Love your card Emma, I saw it on FB and had to pop over to take a closer peek! The candy corn is absolutely adorable! I love how you added the balloons and the Peachy face, just too cute! Wow this is a sweet card. I just love the candy corn. I love how the candy corn man is stepping out with his balloons! I love it. Extremely honored to be in a hop with you Ms. Emma! I love this card, Emma! I love this cute little guy and I love your birthday card..
thanks for having me along the hop and have enjoyed being a guest designer. Emma I love the candy corn, and it's cute face, I love how you incorporatedhim to the birthday. Card. 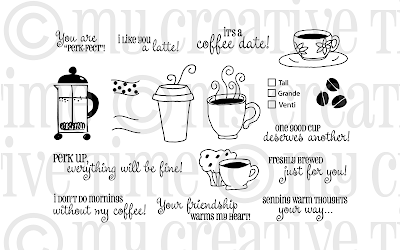 It a very cute card, thanks for sharing and for the inspiration. What a darling card! That little candy corn guy is so fun!! Thanks for your giveaway and for the great inspiration! So cute. I love the candy corn with that sweet face. What a cute card! Who wouldn't like happy candy corn? This turned out too cute, Emma! Love how the candy corn is stepping out of the frame, and the matching envie is adorable! I'm loving Candy Corn Guy! Just saying it makes me laugh. Emma your card is wonderfully fun! Your card is very fun/cute! Thanks for a chance to win these great stamps! oh my gosh, Emma!!! this is sooooo cute!! I LOVE it!!!! thanks so much for helping us surprise Lisa! I love blog hops! HAPPY BIRTHDAY, LISA!!! :) And what a SUPER CUTE card, Emma! This is a perfect pairing: I love Emma's stamps and Lisa's SVG's! Candy corn man is cute! Love the card....I am a new follower to your blog. Oh my goodness! That card is beautiful!!! Thank you so much for being a part of Lisa's birthday surprise! Have a great Sunday! What a CUTE candy corn birthday card! LOVE it!!! I'm a new follower, and I LOVE your stamp sets! Have a couple, but I need more! ;-) TFS, and thanks for the chance to win! Your card is so adorable!! Love it! Candy corn is one of my favorite candies also!! I was just resisting the temptation to buy a bag the other day...because once I get started on them...I can't stop!! Your birthday card is adorable..love the sentiment! What a cutie patootie card!!! I always love your touch of glitter! You all are amazing for doing such a sweet thing for Lisa...I'm sure she was touched! Hugs! Oh my goodness, this is absolutely adorable, Miss Emma!!! I really love how you have the candy corn gentleman stepping off the page through the frame and how you sparkled up the top, hands and shoes. I also love candy corn and always look forward to buying bags of it each and every fall. This is beyond adorable, I am in LOVE with all of your creations always!!! The balloons you added are perfect and I love that you made a matching envelope! Thanks you so much for being apart of this hop with us!! Very cute! I love visiting your blog for great inspiration! Wow, You did a great job, I love your birthday card, is so cute, thanks for sharing and the opportunity to win 2 of your awesome stamps sets!!! A lovely card - love that candy corn - thanks for the hop and for sharing! Totally loving your vision and what an adorable card:) Thank You for sharing. Oh my...this is so over the top cute. The envelope is just the extra touch. Love it!! I love all this!! He is so cute and the balloons look awesome!! Thanks for the chance to win!! I love candy corn creations. Your card is sooo adorable. TFS. The Candy Corn BD card is soooo cute. Love the coordinating envelope, too! How lovely of you to offer such wonderful blog candy. I am a brand-new follower by Google Friend. Yippee!!! Great card. Love how the candy corn is coming out of the card.. too cute! A follower on Blog Lovin. Emma, that card is just adorable!!! I love candy corn too. GENIUS how you had him come out of the card!! Awesome!! Candy corn is my absolute FAV! What a sweet card. Happy birthday to Lisa! What a special surprise. Emma ~ Seriously ADORABLE! I just LOVE the little candy corn, the paper, the face and of course ALL the MCT products! The little details are simply FABULOUS too!